28th March 2014 I Bought 175 shares of KMI at $32.14 per share plus commission. Kinder Morgan, Inc. operates as a midstream and energy company in North America. It operates through Natural Gas Pipelines, CO2KMP, Products Pipelines KMP, Terminals KMP, Kinder Morgan Canada KMP, and Other segments. The company owns an interest in or operates approximately 80,000 miles of pipelines and 180 terminals. Its pipelines transport natural gas, gasoline, crude oil, carbon dioxide (CO2), and other products; and terminals store petroleum products and chemicals, and handle products, such as ethanol, coal, petroleum coke, and steel. The company was formerly known as Kinder Morgan Holdco LLC and changed its name to Kinder Morgan, Inc. in February 2011. Kinder Morgan, Inc. is headquartered in Houston, Texas. Toronto-Dominion Bank is listed on the Toronto Stock Exchange (TSE) with ticker TD.TO and on the New York stock exchange (NYSE) with ticker TD. The Toronto-Dominion Bank, together with its subsidiaries, provides financial and banking services in North America and internationally. The company’s Canadian Personal and Commercial Banking segment offers various financial products and services to approximately 14 million personal and small business customers through a network of 1,179 branches and 2,845 automated banking machines; and telephone, Internet, and mobile banking in Canada. This segment offers financing, investment, cash management, international trade services, and day-to-day banking needs to medium-sized Canadian businesses; financing options to customers at point-of-sale for automotive and recreational vehicle purchases through its auto dealer network; and credit cards. Its Wealth and Insurance segment offers direct investing, advice, and asset management services to institutional and retail clients; and a range of insurance products, including home, auto, credit protection, travel, life, and health insurance, as well as credit card balance protection products. The company’s U.S. Personal and Commercial Banking segment provides retail and commercial banking services in the United States. This segment offers its financial products and services through a network of approximately 1,317 stores located along the east coast from Maine to Florida; telephone, mobile, and Internet banking; and automated banking machines. Its Wholesale Banking segment provides a range of capital markets and investment banking products and services comprising underwriting and distribution of new debt and equity issues; providing advice on strategic acquisitions and divestitures; and meeting the daily trading, funding, and investment needs to companies, governments, and institutions in financial markets worldwide. The Toronto-Dominion Bank was founded in 1855 and is headquartered in Toronto, Canada. 3rd March 2014 I Bought 100 shares of BNS at CAD62.68 per share plus commission. The Bank of Nova Scotia (the Bank) is a diversified financial institution. As of October 31, 2011, the Bank offered a range of products and services, including retail, commercial, corporate and investment banking to more than 18.6 million customers in more than 50 countries around the world. The Bank has four business lines: Canadian Banking, International Banking, Scotia Capital and Global Wealth Management. In January 2012, the Company closed its acquisition of 51% of Banco Colpatria. In April 2012, the Company through Scotia Capital Inc. acquired Howard Weil Incorporated. In April 2013, Bank of Nova Scotia acquired a 50% interest in Administradora de Fondos de Pensiones Horizonte SA. My Total dividends in February are € 346.47 ($ 470.30). After tax payments, net dividend income is € 251.18. 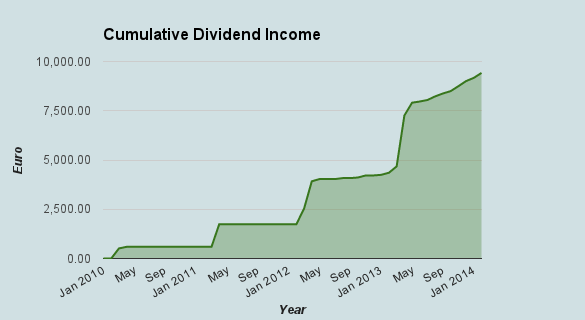 In year 2013, my net dividend income in February was € 83.30. My portfolio's net dividend income increased by 202% compared to last year to February, mainly due to new share acquisitions. 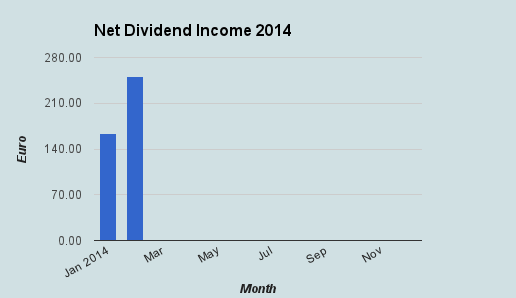 This month's dividend increased my cumulative dividend income € 9,420.13. My total net dividend income for this year are now € 414.51.